The White Shark Projects team all have a passion for sharks and the ocean. If it was our decision, we would take clients out all day every single day…. But it is not up to us. Mother Nature is the boss at sea and we rely on her bringing us the right sea conditions to enable us to give a safe, comfortable and enjoyable shark experience. Billowing winds, skimming the surface of the dark gray sea. Churning the water, forceful and wild. A distant howling, the promise of an untethered force. Swirling mute skies, the storm approaches. to the foamy wash below. She will take no prisoner’s, have no mercy. into the depth’s of the angry sea. ethereal, powerful, a universal queen. 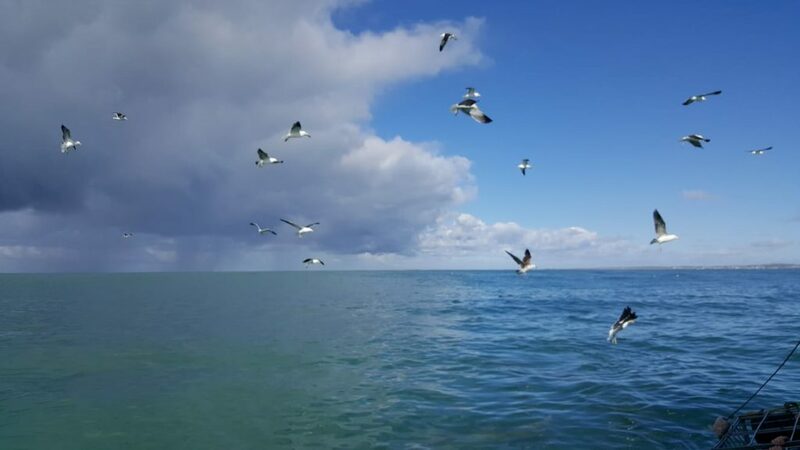 Even though Kleinbaai, where our cage diving vessel Shark Team launches from, is relatively sheltered, there are days where we have to cancel due to choppy sea conditions. After all, your safety and comfort is our number one priority. We want to give our clients the ultimate cage diving experience and have them leave feeling ecstatic with the fact they have got close up and personal with the world’s ultimate apex predator, the great white shark. We would rather you be enjoying this wonderful experience than staring at what you ate for breakfast 2 hours before hand. The following are just some of the unfavourable sea conditions. HOWEVER, it is important to remember that these are not set in stone. Our skipper will assess all the conditions on a daily basis taking into account wind direction, wind speed, swell height, wave period, dive site depth and location, as well as harbour conditions. – Heavy rain not forecast to stop. – Thick fog not expected to abate (lessen). – South West wind is the worst so normally no more than 15km/h average gusting to around 20km/h and swell height no more than 3m. – North West wind no more than 30km/h average. – A West wind above 20km/h already uncomfortable – 30km/h would usually be the cut off. – Around the island we can anchor either side to find a lee from the wind – so can anchor either side in 40km/h wind as long as swell height is below 3m. – If swell around 3m or above we need to be able to anchor in deep water of around 15m and above. – In a North West or West wind we can anchor on East side (more protection on East side) and in a South, South East or East we can anchor on the westerly side depending on swell height. – A South West wind of above 15 to 20km/h is difficult on both sides of the island. – The average swell height also affects us more when at the island as we are further out at sea so more exposed. Aerial view of Dyer Island and Geyser Rock – winter dive site. * Bear in mind for both sites the wave period also has to be considered. Anything above 14 seconds increases swell height. 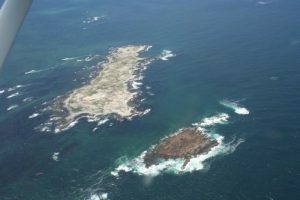 * Generally in summer we can work closer to shore in Joubert’s Dam and the wind is normally East, South East or South so we can go to sea in stronger winds than at the island as the island is further out to sea so more exposed. As Kleinbaai harbour is a very small exposed harbour to launch from, the first concern is to be able to safely get out and come back in to the harbour through breaking swell, as well as to launch and come back in strong wind. 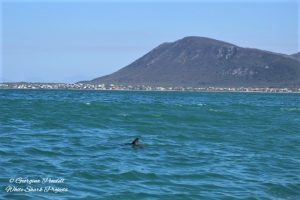 These are just some of the rough guidelines as even though forecasts are quite accurate, if unsure, we will normally do a late standby trip to check first before our clients take the journey from Cape Town to us here in Gansbaai. White Shark Projects understand that for most people shark cage diving is a once in a lifetime experience and we want you to leave us with memories that you will treasure forever. 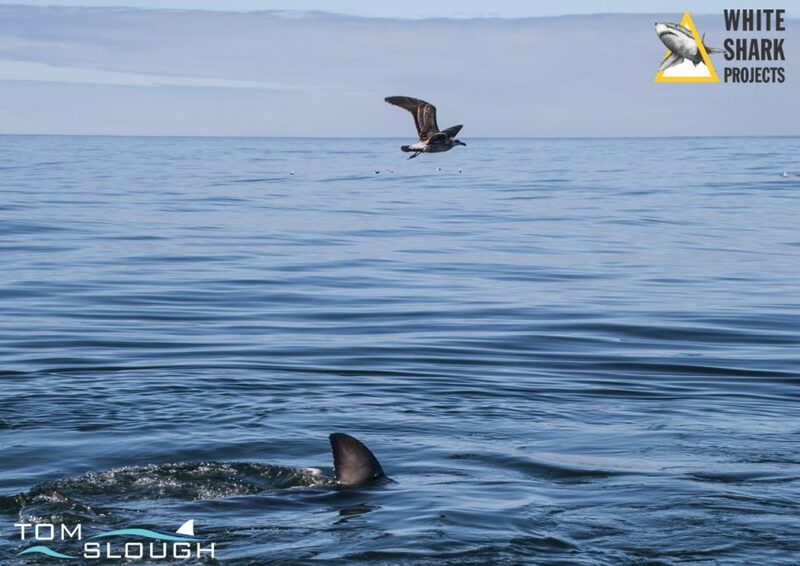 Great white shark gliding gracefully past White Shark Projects cage – giving divers a once in a lifetime experience. If you want a fun and educational experience that all the family can enjoy – contact us!